Quantum psychology that I develop in this presentation is an integral scientific approach to psychology of our self and all its experiences and behavior. It is a science that can scientifically deal with all the psychological disorders mentioned in the mental health diagnostic manual. But its real scope is even beyond this traditional expectation of the science of the psyche: it consists of nothing less than the development of people of personal growth—the original goal of humanistic and transpersonal psychology. The difficulty because of which such an integration has eluded us up till now is well known. There are dichotomies in our experience and behavior that seem impossible to resolve by any of the worldviews known until now—spiritual or Newtonian materialistic: Subject-object, unconscious-conscious, body-psyche, impersonal subject-ego-personality, conditioning-creativity, and all that. There are also compartments of our experiences that seem to deny a holistic outlook: the I/we/it, normal-paranormal, one life-many lives, sensing/thoughts/feelings/intuitions, psychopathology/positive mental health, mundane/sacred. There is so much stuff to integrate in any formulation of psychology that can stake a claim to the word “integral!” Do we abandon the search for an integral psychology and accept the piecemeal compartmentalizedway we deal with mental health today? But everybody knows that the piecemeal ways have been unsatisfactory in providing relief to sufferers of psychopathology and pursuers of positive mental health have not done so much better either. There is also a lot of confusion if psychology can rise beyond the mundane and deal with the sacred—the spiritual aspects of human beings. I submit and as I will demonstrate in this lecture, that only quantum physics and its inclusive worldview can do the requisite integration—quantum psychology which is, first and foremost an integral psychology. Take a prime example, the dichotomy of the unconscious and the conscious—how do we distinguish between them? Easy you say. Unconscious is when we are not aware; conscious is when we are aware. Also since Sigmund Freud—the founder of modern psychology introduced the concept of the unconscious and since the concept is so popular, surely all branches of psychology must accept the concept as basic! Not so. If you take a view of the world according to the philosophy of scientific materialism—all phenomena consist of matter moving in space and time--as not only cognitivists do but also humanistic psychologists and even many parapsychologists, you will be in a conceptual quandary. Where does the unconscious reside? Quantum physics has answered this question. Quantum physics says objects are waves of possibility before they become particles of actuality when we observe them. Where do possibility waves reside before measurement, before observation? They reside in the realm of potentiality, outside space and time, said Werner Heisenberg, the co-discoverer of quantum physics. In quantum psychology, unconscious is recognized as the domain of potentiality. Quantum concepts sound mystical to our modern ears because mystics have talked about two levels of reality for millennia. For mystics, the two levels of reality are called transcendent and immanent, popularly heaven and earth. Is quantum physics mystical physics? Hardly. The idea of possibility waves being waves in a transcendent domain of potentiality is experimentally verified by myriad experiments such as the famous double-slit experiment. For another example take the subject-object dichotomy. It is a fundamental fact of life that whenever we become aware of an object, we see ourselves separate from the object, an experience that we call the “I.” But cognitive psychology, a popular branch of psychology much pursued in the academia has no idea about the neurophysiological basis of the subject pole of the subject-object experience of perception. The basic assumption of neurophysiology and cognitive psychology is that all stuff of the world including those of psychology is made of material objects and their interactions. You can only make objects out of objects, never an experiencing subject! See the paradox? As I have shown in my very first book on quantum physics and consciousness, The Self-aware Universethe solution of the famous quantum measurement problem solves this paradox of perception as well. Even after the development of a satisfying mathematical explanation of why the meaning-giving nonphysical mind is needed by the philosopher John Searle and physicist Roger Penrose for more than two decades ago, psychologists cannot agree. Worldview again. Scientific materialists, that is, behaviorists, cognitivists, and neurophysiologists for you, go on insisting that mind has to be brain-based; otherwise we would be haunted by the specter of dualism—how does a nonmaterial mind interact with matter? In contrast, spiritual psychologies such as yoga psychology (of East Indian origin) and the modern transpersonal psychology are so hell bent in keeping science out of the arena of the mind, they never address the problem with dualism seriously. There is an exception—the psychologist Carl Jung who gave us the concept of one world-soul that contains both matter and psyche. Jung’s personal proof was his own discovery of synchronicity—the occasional meaningful coincidence of a physical and a mental experience that all of us have. But Jungian psychology’s message remains largely unheeded by the psychology community. Quantum psychology resolves the mind-body dualism and in this way finds its deep relationship with the earlier thoughts of Jung. The psychologist Abraham Maslow founded transpersonal psychology in the nineteen seventies with a new idea of positive mental health and nowthere is much enthusiasm for such positive psychologies. Maslow saw positive mental health as developing the capacity of dealing with all of our experiences—“everything that is the case”—with balance and harmony. Clearly, this requires that elusive integral science of experience that only quantum physics can provide usas I will demonstrate in this lecture. Freud speculated much about the connection of neurosis and creativity. Quantum psychology not only elaborates Freud’s idea but also provides people with neurosis (and who among us is not even a little bit neurotic in some area?) the techniques that allow them to heal their neurosis using their own creativity by themselves (self-help) or in conjunction with that of their therapist. Yes, quantum psychology emphasizes a new kind of redefinition of the therapist-client relationship that will revolutionize the whole business. There are new developments in psychotherapy—empirical to be sure—called by various names of energy psychology or chakra psychotherapy that are waiting to be integrated within the mainstream. But in the absence of an integrative science of all of our experiences, such integrations can never come. There are now new ideas of biology (the morphogenetic fields of form-making a la Rupert Sheldrake and the empirically discovered field of epigenetics) that, seen in a quantum physics framework (as I have shown in my book The Quantum Doctor), gives us a scientific theory of vital energies—the movements that we feelin conjunction with physical body processes. In this book, I will demonstrate that this sametheory brings the much-needed dimension of emotions into psychotherapy and give us a true hold on developing emotional intelligence. Inclusion of reincarnation in quantum psychologymakes past-life therapy, a popular branch of the modern psychotherapy scene, scientifically legitimate. In this way, in Quantum Psychology, I present a mature understanding of this complex field that enables me to integrate not only the diverse disciplines of psychology but also offeran integral psychotherapy for both people seeking relief from psychopathology and people seeking positive mental health and exploring meaning and purpose with their lives. Many people today are disgruntled with the religion they grow up with whose myths and images no longer apply to their experiences. The materialist scientist exploits the spiritual hunger of these people by feeding them cosmology, outer space, and science fiction ideas of extraterrestrial life on one hand and unprecedented ability to (locally) connect with technologies like the Internet and cell phone on the other hand. But momentarily expanded consciousness and local connectedness are only the beginning of human spirituality. To wake up to the full human spiritual potential, we also have to learn to transform, we have to attain psychological maturity beyond narcissism, we have to embrace creativity in our inner dimensions of experience. This is the invitation that quantum psychology offers. Even spiritual enlightenment is not left out. There are some authors who claim to have arrived at an integral psychology, notable among them the philosopher Ken Wilber. I will have more to say about Wilber’s work in the body of the lecture proper, but it suffices to say that Wilber’s attempts are incomplete to begin with simply because he always leaves out the material part of our being from his integration. Other authors try to integrate Western psychology with Eastern psychology (for example, psychologist Brant Cortright), but these attempts are equally incomplete; for example, they do not even incorporate reincarnation in their treatment (nor does Wilber by the way). In this abstract, I have emphasized the explanation and integration of the various forces of psychology achieved in my work, but in the body of the lecture, I will explain basic quantum physics as well. Since the average psychologist is not familiar with quantum ideas anyway, this should work well with the audience. Theoretical Quantum Physicist Dr. Amit Goswami is a retired full professor from the University of Oregon’s Department of Physics where he served from 1968 to 1997. He isa pioneer of the new paradigm of science called “science withinconsciousness,” an idea he explicated in his seminal book, The Self-Aware Universe, where he also solved the quantum measurement problem elucidating the famous observer effect. 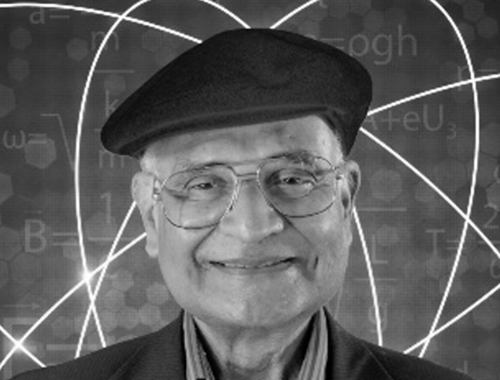 In his most recent book, The Everything Answer Book (April 2017), Goswami's basic premise is that quantum physics is not only the future of science, but it is also the key to understanding consciousness, death, God, psychology, and the meaning of life. In short, quantum physics offers a theory of everything.